MALE PATTERN BALDNESS IS THE MOST WIDELY EXPERIENCED TYPE OF HAIR LOSS IN MEN. GET THE FACTS ABOUT HOW IT MAY HAPPEN TO YOU. Q. What causes male pattern hair loss? Men lose their hair in a predictable way, a form called male pattern baldness, but the correct medical term is androgenetic alopecia. This type of hair loss has no known cause. Researchers have found the patterns to be predictable, so there is a strong genetic link. In addition, aging is usually a significant factor in the production of the hormone dihydrotestosterone (DHT), which causes hair follicles to shrink. Stress, medications, and poor grooming, sleeping and nutrition habits can speed up the hair loss process, as can such diseases as lupus, diabetes and heart disorders. Q. Why am I losing my hair? Physically, a hair follicle grows hair in phases consisting of active growing, resting, fall-out and new growth. Anything that affects the hair follicle negatively, for example DHT production, causes the new hair to grow in smaller and thinner. Eventually the hair may not grow back at all, which is how male pattern hair loss happens in a predictable pattern, slowly and gradually over time. Q. When will I lose my hair? There is no way to know when you will lose your hair. Doctors know only how it will progress once it starts happening, based on the pattern of hair loss you currently present. Q. What is the Norwood-Hamilton Scale of male pattern baldness? This is the name of the actual chart that doctors use to predict the progression of an individual’s hair loss. There are different levels of hair loss, from subtle frontal hairline loss to severe baldness at the crown, but researchers have found that hair loss progresses in men the same way, so this is a useful tool for determining the current stage of your hair loss. Q. Am I going totally bald? The Norwood-Hamilton Scale will help you and your hair loss specialist or doctor to determine the future pattern your hair loss may take. If your hair loss is very progressive, you can opt for shaving it all off and being bald and proud. Also, you could investigate approved treatments that can halt the progression (especially if you are very young), find out if you’re a candidate for hair transplant surgery to fill in specific bald spots, or opt for non-surgical hair replacement. Q. What are approved ways for stopping male pattern baldness? First, you should visit your doctor right away to rule out any health-related causes for your hair loss and possibly get a prescription for Propecia, the only FDA-approved medication for halting future hair loss, which blocks DHT from accumulating on hair follicles. Another approved treatment is topically applied over-the-counter Rogaine, which stimulates hair growth from the scalp application. Laser hair therapy stimulates follicles using a low-level laser light, and you can also investigate DHT-blocking shampoos and the herbal supplement saw palmetto, which may work in conjunction with the above treatments. Q. 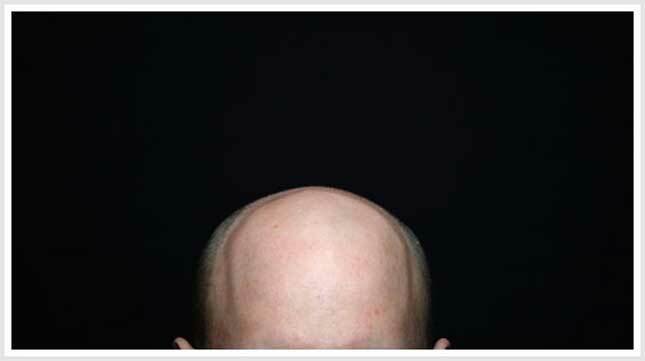 Can my hair regrow in my bald spot? Hair loss specialists urge you to begin a hair loss prevention regimen as soon as possible that includes the approved ways to halt hair loss mentioned above, because once hair follicles die, they cannot regrow hair. If hair loss has been evident for several years, you will not regain hair in those areas. Q. What about hair-regrowing claims I read about on the Internet? Be wary of any other claims for miracle products that you learn about on the Internet, because if you waste time and money using products that are not tested, studied or approved, then you are delaying the use of approved products that will halt your hair loss and possibly regrow some hair from follicles that are not dead. Q. Can hair transplant surgery help me get my hair back? It’s a great idea to consult a skilled and experienced hair transplant surgeon, who will determine, as scientifically as possible, what your pattern of hair loss will be and whether you have enough donor hair for the procedure. The result of the surgery is a permanent solution to hair loss in the transplanted area, but this will not protect against future additional hair loss in other parts of your scalp. Q. What’s non-surgical hair replacement? This is the best option for those who want their full head of hair back. Non-surgical replacements are hairpieces that can be custom-made from 100 percent human hair to look exactly like your real hair and matched to style, texture and color. Skilled hair replacement specialists can match any hairline (even from photos of you) and also determine a maintenance plan and type of hairpiece that will best fit your lifestyle and budget.